DentLight Fusion | Dentlight Inc. Using a patent-pending Focused Beam LED Technology, Fusion provides 1500 mW/cm2 of output power. 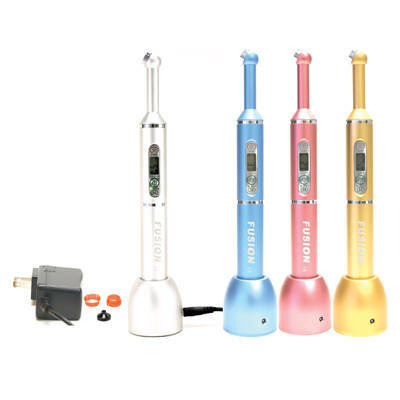 The key features of the Fusion curing light from DentLight include backlit metal keypad controls, 7-mode digital displays, interchangeable 360° swivel light probe with 10 mm large tip, dual power levels, and the ability to cure all materials. Other unique features include sequential modes for full-arch, 1-click operation; optional tacking tips, lens modules, and caps to cure 3 mm to 13 mm; and the ability to directly mount and charge the light on a dental unit. This light is our work horse for the past few years. 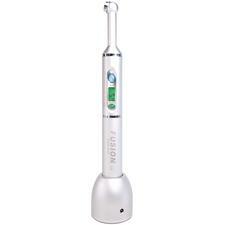 It is cordless and has excellent curing power. I compare this to the Valo as far as quality and curing, but it's a less pricey. The Valo is the gold standard and this would be just underneath it! This light has a small foot print, and it's easy to get to the 2nd molars due to it's small head. The new model comes with simplified buttons that make it even easier to use. If you're at a trade show, talk to the inventor, he'll show you how you can abuse the light, swing it from a lassoo, rodeo a cow and drop it on concrete, but it keeps on working. I've been practicing for 27 years and have used several curing lights. I had been reading reviews for about a year, trying to find a new light when I kept reading great reviews about this light. I wanted a light weight, cordless, wide and deep depth of cure, with a short curing time. I also like a bargain. The Fusion was my answer. I bought three of them and love them. After owning them for a year I attended a Gordon Christianson lecture and he highly recommended it. During that lecture I recommended it to three different dentists, who each bought it and have thanked me for the recommendation.